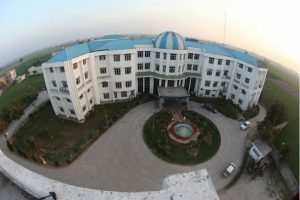 Amritsar College of Engineering and Technology, Amritsar (ACET) was established in the year 2002. The premier institute has been duly approved by AICTE, New Delhi as well as by the Government of Punjab and Govt. of India. It is affiliated to Punjab Technical University, Jalandhar. ACET symbolizes the maturing of Indian technical ability and can-do entrepreneurial spirit. The institute endeavors to educate the students to become not only competent professionals but also excellent human beings who contribute towards the welfare of the society and towards raising the quality of life of its people. Established in July 2004 to assist students to get first job through campus recruitment. Placement Cell has Big Working Area with 10 Computers with WI-Fi connection. Experienced team of 6 members supported by all department co-ordination, has achieved excellent results. Placement cell is performing following duties apart From campus Recruitment. Grooming Students for better placements by organizing Group discussion, HR Interviews Sessions, Communication Skills program, mock interview etc with in the campus. Support Students in arraigning them 6-8 weeks industrial training of the 4th Semester students in the reputed organization through out the country. Support Students in arraigning them 6 Months industrial training of the 7th Semester students in the reputed organization through out the country. Spreading information of general interest like dead lines to apply for MBA programs. Organizing seminars for guidance on UPSC Examinations. Campus: Amritsar College of Engineering and Technology, Amritsar (ACET) was established in the year 2002. The premier institute has been duly approved by AICTE, New Delhi as well as by the Government of Punjab and Govt. of India. It is affiliated to Punjab Technical University, Jalandhar. ACET symbolizes the maturing of Indian technical ability and can-do entrepreneurial spirit. The institute endeavors to educate the students to become not only competent professionals but also excellent human beings who contribute towards the welfare of the society and towards raising the quality of life of its people. Due to the changed scenario ushering in an accelerating growth rate and intense global competition, we are faced with new challenges. More than ever before, skilled, talented and highly competent technocrats and able managers have become critical and instrumental as harbingers of evolutionary change. It is in this context that the College endeavors to have a meaningful interaction with industry so that real life problems may be discussed in the classrooms and solutions attempted in the well-equipped laboratories of the institute. Central library: A Library is a collection of information, sources, resources and services. In this repository of knowledge, the information is acquired, processed, arranged and disseminated. The main objective of any Library is to cater to the literary needs of the users. Central Library of ACET has been in existence since May, 2002 and is developing day by day. Earlier, it was established in the Main Block but now its building has been shifted near the Mechanical Department. It houses a spacious section of the college building i.e. 650 sq.m. Fully air conditioned library provides comfortable and conducive environment of learning. Regular visits of students in the library makes it breathe an air of life & encouragement always. Central Library provides Wi Fi facility to access Internet. Seven departmental Libraries are working successfully under the aegis of Central Library. Hostel: Separate hostel facility for boys and girls within the campus is available for the students who take admission from other cities. Hostel has attached washrooms and geysers, air cooler and other necessities to make the life as simple and comfortable as possible. Boys and girls hostel has separate gymnasium and common room. Hostel residents enjoy the transport facility to visit the city on every weekend. For the security of girl residents, the hostel attendants accompany them. Facilities like TV, Newspaper, Indoor Games (Carom-board, Chess) are also available in the hostel. Students are required to observe strict discipline in the hostels. Any attempt to create disturbance or cause damage to hostel propertyor indulge in indecent behavior with fellow residents or mess staff / other employees/ warden can lead to disciplinary action including expulsion from the Hostel, suspension, rustication from the College. Students (Boys) shall mark their attendance daily between 9.00 PM and 9.15 PM in the register maintained with the Hostel Warden. Absence without prior permission will involve disciplinary action. There would be no unnecessary movement or playing of games in the corridoors. No day scholar is allowed to stay in the college campus after the last College bus leaves the campus and on holidays. Any resident sheltering a day scholar will face expulsion from the hostel. Similarly, no resident student will be allowed to enter the gate except those who have been allowed by the warden to go outside for a particular purpose and for a particular period and they will be allowed to enter by showing the permission slip and the identity card at the main gate. No outside/ non-resident student will be allowed to stay in the hostels. No female guest is allowed to visit the room of the boys, hostel. No male guest is allowed to go beyond the guest room in the girl’s hostel. Students will not be sitting / playing in the Hostel/Canteen/ lawns during working hours when their respective classes are being held. Students are responsible for glass, electrical and other fittings in their hostel rooms. They will have to pay for any breakage of these fittings. Any student found damaging, breaking hostel property anywhere will incur disciplinary action besides replacement of the property. Students should not possess or operate any electrically operated appliances. No intoxicants, weapons/ sticks are allowed to be kept / used in the hostel premises. Loud music is not allowed to be played in the hostel. No student will take any vehicle towards/ near the hostel area. No mobile phones are allowed inside the College with any students.If found, these are liable to be confiscated. Students will not plan or participate in strikes/ mass cuts or make unnecessary demands. Students are expected to know the facilities / difficulties at the time of allotment of hostel accommodation. Failure of electric supply or telephone line will not be the cause for missing classes / tests. Students are expected to make their own arrangements for such eventualities. Students will not directly or indirectly indulge in ragging. The concerned student will have to prove innocence in case of any reported incident of ragging, failing which he/ she will face expulsion from the hostel / College. A resident of hostel has to take meals in the mess. He/she has to pay for the number of diets as per the mess rules framed from time to time. A student who doesn’t actually reside in the hostel without prior permission will lose the right to hostel accommodation, which will be cancelled forthwith besides incurring strict disciplinary action. Mess timings as fixed by the warden from time to time will be strictly adhered to. A code of decency will be followed in the mess. No MEALS will be served in rooms and no mess utensils are to be taken outside the dining hall. For availing mess-off, the students should inform the warden in writing at least 24 hours in advance of the diet from which the off is desired. A minimum of six consecutive diets are essential for availing the rebate. The duration of mess-off has to be intimated in advance. In the absence of any written notice in advance, no rebate will be allowed. No refund of hostel rent (in full or part) will be allowed after the initial allotment even if the student leaves the hostel on his own or is expelled from the hostel. Hostel security will be refundable only when the student leaves the College. Students will pay the mess bills in time every month. Any difficulty should be promptly reported to the warden/ attendant chowkidar and students will avoid visitor’s coming to the Principal directly. Students will not disturb the Principal at all at night. No girl student will leave hostel / campus without written permission of the Warden/ Principal and without making entry in the Hostel Register and Main Gate Register, noting the exact time of leaving, destination and telephone number. Time of arrival will be noted on return. No girl will be allowed to return to the hostel without the permission slip duly signed by the parents with all entries completed. The student must be inside the hostel premises by 6.30 P.M during summer (April to September) and by 6.00 P.M during winter (October to March). Girls are not allowed out-pass on a working day. Once a girl comes on Monday, she will not be allowed to go home before Friday, unless she has the written permission of the parents or they personally come to pick up the resident. Permission slip should be completely filled and signed by the warden. No permission slip will be given to the students in advance. The slip will be given at the time of departure with exact time, address and phone number written. No girl should be allowed to leave the hostel before 5.45 A.M and after 6.00 P.M. Girls from distant places are not allowed to leave the hostel after 4.30 P.M. Girls are not allowed to visit friend’s places or their relatives for night stay unless there is written permission of the parents. No guest is allowed to visit a resident girl except those mentioned by the parents in the hostel allotment application. Similarly only those incoming telephone calls will be entertained which have been allowed by parents in the allotment application. Maximum time of call will be 6 minutes. Use of STD will be allowed after making an entry in the Register about the telephone number dialed. Girls can’t use the extension of phone or intercom at anytime. When the classes are going on, girl students are not allowed for movies or market. Girls can leave the hostel on holidays during 7.00 to 9.00 A.M or 4.00 to 4.30 P.M. only with duly signed slips from the warden. There will be no dance parties in the hostel. No birthdays will be celebrated after 9.00 P.M.
At the time of admission to the hostel, parents I guardians should accompany the girl. They should also provide list of the persons who are permitted to meet the girl. Only authorized persons can meet the hostlers inside the hostel. Authorized persons can visit the hostlers on Saturdays or Sundays between 10.00 AM and 5.00 PM. Authorized persons are expected to fill up the visitor’s register and also specify the relation with the hostler. Hostlers can meet their guests in the visitor’s room only during the stipulated time. Guests would not be allowed to stay in the hostel. Only the mother or sister of the hostler can stay in the hostel for a maximum period of two days. Hostlers should mark their attendance daily at the stipulated place at the time of attendance. The doors of the Hostel will be closed immediately after the attendance. Coming late to the hostel,without prior permission, would be considered a serious offence. All hostlers coming late to the hostel would mention this fact in the register provided for this purpose. A fine up to Rs. 50/- would be imposed on any hostlers reaching the hostel after the attendance is over. Day scholars are not allowed to stay in the hostel. Cooking or keeping gas cylinder in hostel rooms is completely banned. Hostlers are advised not to keep money or jewellery in their rooms. In case of any loss, its sole responsibility shall lie with the hostlers. No hostler shall be allowed to change the room during the session. All hostlers are expected to maintain proper discipline in the hostel. Any attempt to create disturbance/damage hostel property/ indecent behaviour with fellow residents or employees or warden can lead to disciplinary action. In case of any infectious disease, the particular hostler can be asked to leave the hostel. Hostlers will be allowed to leave the college campus only after showing the gate pass collected from the hostel attendant by stating reason for leaving the campus. Also they have to make entry in the hostel register before leaving. Even during the college hours from 9.00 a.m. to 5.00 p.m., any hostler going outside the main gate must get written permission from their local guardians. If the girls want to visit their local guardians, normally. they have to be picked up from and dropped at the hostel by his/herr local guardians. Once the wards leave the college campus, they will themselves be responsible for their safety. The wards will have to get the application signed by the hostel warden before leaving the hostel. In case they want to leave the hostel for a period of more than 6 days, they must obtain approval of the Principal. Whenever a hostler has to go back to her home, the application seeking permission regarding this should be given to the hostel warden on day before their going to home. Hostlers can visit the city in groups on Saturday in the college bus. They are expected to maintain proper behavior under instructions given by the warden. Disobedience of any sort may result in suitable disciplinary action.